Canadians are requesting poppies to show their solidarity in the wake of two terror attacks. An estimated 600 poppies were distributed in a few hours at the National War Memorial Saturday. “We only give out what was asked of us,” said Tim Blanchard, past president of the Royal Canadian Legion’s Montgomery Branch. Poppies are typically worn in recognition of Canadians who gave their lives for our freedom. Despite many requests over the past week, “we have not been authorized” to distribute poppies earlier, said Blanchard. The policy won’t be changed, and poppies are being handed out come Oct. 31, he said, as per usual. The Legion’s annual poppy campaign runs from the last Friday in October to Remembrance Day. Anyone who wants a poppy sooner can go to a Legion branch, said Blanchard. 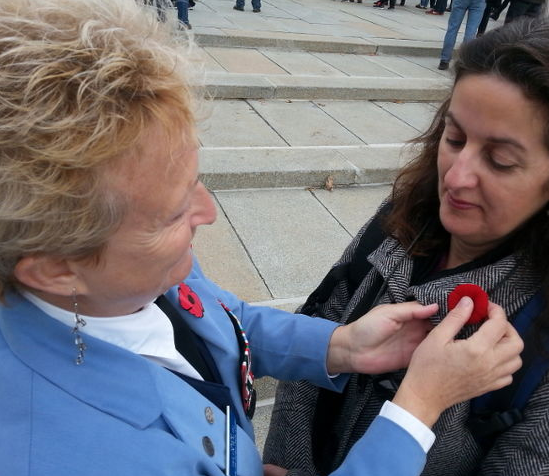 Francine Proulx of Montreal approached a group of Legion members seeking a poppy. Blanchard and another man removed theirs to give them away. Helen Walsh from the Canadian Association of Veterans in United Nations Peacekeeping said she ran out of poppies by noon. Roughly 18 million poppies and 70,000 wreaths, crosses and sprays are distributed across Canada and overseas annually.